The African Press Agency has announced that the African Union (AU) unveiled a new flag at its 14th Ordinary Session of the Assembly of Heads of State and Government taking place in Addis Ababa on 31 January 2010. To tunes of the AU anthem, the new flag was hoisted by the outgoing Chairperson of the African Union, Libyan President Muammar El Gaddafi. It was during the 8th African Union Summit which took place in Addis Ababa between 29 and 30 January 2007, that the Heads of State and Government decided to launch a competition for the selection of a new flag for the African Union. They prescribed that the design should include a green background for the flag symbolising hope of Africa and stars to represent the Member States. Pursuant to this decision, the African Union Commission (AUC) organized a competition for the selection of a new flag for the African Union. All African citizens were free to compete, including those in the Diaspora and the laureate would be awarded a prize in cash. The AUC received a total of 106 entries proposed by citizens of 19 African countries and 2 from the Diaspora. The proposals were then examined by a panel of experts put in place by the African Union Commission and selected from the five African regions for short listing according to the main directions given by the Heads of State and Government. At the 13th Ordinary Session of the Assembly, the Heads of State and Government examined the report of the Panel and one of the proposals to become the new flag. The flag is now part of the paraphernalia of the African Union and replaces the old one. No information has been provided as to who is the winning designer. The darker shade of green matches the dark shade shown in photographs of the flag being raised at eh AU meeting, rather than the illustration in the AU media release. I note that the new drawing includes a fine white line outlining the map, particularly noticeable around Madagascar. I can see that this is a useful design improvement, but is this an enhancement that has been made by the flag manufacturer, or a design detail of the official flag that was not observed in the original illustrations? I also note that the small off-shore island nations are included - Cape Verde, Sao Tome & Principe, Equitorial Guinea (Bioko), Comoros, Seychelles and apparently Reunion, though presumably not the Canary Islands, Azores and Madeira. New York (TADIAS) - One the evening of September 28th, 2009, Yadesa Bojia, an Ethiopian American artist based in Seattle, Washington, was babysitting his children while watching CNN when he recognized an image on his TV screen of one of his artworks. "That’s my design!" he exclaimed. He was looking at the new African Union flag created using a sketch that he had submitted for competition two years earlier. "By then I had almost forgotten about it because at that point I had not yet heard back from AU," Yadesa (a.k.a. Yaddi) recalled in a recent interview with Tadias. Yaddi spotted the flag on Lary King Live whose guest was Muammar Gaddafi, the Chairman of the African Union as well as the head of the African Union Commission (AUC) at the time. The Commission was tasked to come up with an updated insignia for the continental body, and the interview conducted at the Libyan Mission in New York showed Gaddafi flanked by the new banner. "I could not believe my eyes," Yaddi said. Immediately, Yaddi contacted the AU headquarters in Addis Ababa to enquire about the new flag. "What flag?" the perplexed women on the other end of the receiver replied. "Sir, I have no idea what you’re talking about." "To top it off the next morning there was Gaddafi again on CNN wearing my design all over his clothing," Yaddi remembered laughing. "I was losing my mind." Yaddi would eventually learn that his work was selected earlier that year by the Commission out of approximately 127 entries submitted in the span of two years from artists residing in several African countries and including two contestants from the Diaspora. Three months after he first saw the flag on CNN, Yaddi finally received a formal letter from the African Union announcing the adoption of his design as the continent’s new emblem. The letter included an invitation along with a paid travel package for him and his family to attend the flag’s inauguration ceremony during the 14th Ordinary Session of the Assembly of Heads of State held in Addis Ababa on January 31st, 2010. The design depicts a green Africa, the color portray the hopes and aspirations of the continent, resting on rays of a white sun that symbolizes the people’s desire for friendship and co-existence with all countries around the planet. The map is circled by a ring of golden stars each representing member states, wealth and a bright future. "I was told by an official from the Ethiopian ministry of Foreign Affairs that when Meles found out the winner was an Ethiopian, he told them to go find the guy," he said. "Once I got to Addis, on the second day of events, I was approached by the protocol chief who informed me that the Prime Minister wanted to see me. So my wife and I had the chance to meet with the PM privately who told me that he was proud of my work." He added: "In addition, I also met with President Zuma of South Africa and other leaders who were very complimentary of the flag. Not to mention the five hours I spent with President Girma Wolde-Giorgis at the national palace." I recently "deduced" the various arithmetic values of the various elements of the flag. Map of Africa lifted in svg format from Wikipedia. "APA-Addis Ababa (Ethiopia) The African Union (AU) will soon have a new flag; APA learns Friday in Addis-Ababa during the in-camera meeting of the Executive Board's meeting as part of the preparatory sessions of the 12th Summit of the Organisation. The decision to have a new flag surfaced over a year ago, but the process was speeded-up under the aegis of the current Chairperson of the Commission, Mr. Jean Ping, who referred his detailed report on the period from July to December 2008 to the approval of the Executive Board. According to the report that APA skimmed through, the Commission received 116 proposals, five of which were eventually selected with an eye to redesigning the colours of the pan-African flag. The report of Mr. Ping who took the leadership of the Commission in April 2008 reflected the main activities of the institution during the six past months. The Executive Board, the activities of which were still going on Friday in the Ethiopian capital city host town to the AU headquarters, is looking into all the reports referred to them before an agenda is tabled before the Heads of State and government during the 12th ordinary session billed for February 1 - 3 2009 in Addis-Ababa. 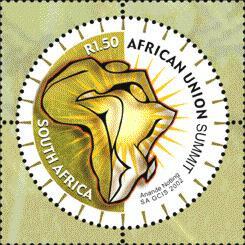 The African Union (AU) was launched in Durban, South Africa, 9 July 2002. It is the successor to the Organisation of African Unity (OAU). The AU has not yet adopted any new symbols although there is a special logo for the inaugural meeting tomorrow which is being attended by Heads of States. This was featured on a stamp issued by the South African Post Office last week. The AU is expected to formally adopt new symbols (including a flag) in due course. Today is the final session of the OAU, following which its flag will be lowered. The advertisement below about a competition to design symbols (including a flag) for the newly formed African Union was published in the Sunday Times (Johannesburg) on 13 April 2003. The African Union (AU) is in a process to design its new symbols: An anthem, flag and logo. The Public is invited to enter for the AU Symbols design competition. The brief: The Anthem. An anthem shall be composed in a way that the first stanzas or a refrain and two verses sung or executed with musical instruments during official ceremonies do not exceed one minute. Each dossier submitted in one or several of the working languages of the African Union (English, Arabic, French, and Portuguese) shall include: The lyrics of the Anthem; The music written in scores; the lyric and music written in scores; A good sound recording of the instrumental and/or sung music; A clear and concise explanatory note. The Flag: Each work, executed in colours, shall be submitted in three copies, accompanied by a clear and concise explanatory note written in one or several working languages of the African Union. The note shall indicate among other things, the proposed meanings of the colours, designs, figures, or symbols, if there are any on the flag, as well as their respective sizes. The Logo: Each work, executed in colour and in black and white shall be submitted in three copies, accompanied by a clear and concise explanatory note written in one or several working languages of the African Union. The note shall indicate, among other things, the proposed meanings of the colours, designs, figures or symbols, if there are any, on the flag, as well as their respective sizes. Proposals for a motto are also welcome. However, these proposals will not be subjected to a competitive process. The first ten mottoes shall be submitted to the Second Ordinary Session of the Assembly of Heads of State and Government slated for Maputo, Mozambique, in July 2003. Each work shall be a new creation or a modification of the OAU symbol. In composing the symbols, candidates shall draw inspiration from, the following values (list indicative): Struggle, defence, courage, sacrifice, victory, glory, peace; Freedom, liberation, independence, sovereignty; Work, effort, prosperity, wealth, industriousness. Union, unity, solidarity, fraternity; Sanctity of life, sacred, nature of the African continent, purity, respect, dignity, justice, durability, universality, eternity; Hope, faith, future). These values may be drawn from African History, culture, civilization, spirituality, inspiration, geography. Similarly reference may be made to Africa as one of the cradles of mankind. Competition Rules. All three competitions shall be open to nationals of all Member States. It is possible for a candidate to submit entries for on or more of the three competitions. No entry submitted shall be returned to its owner. The entry submitted shall be returned to its owner. The entries received together with a clear and concise representation shall be submitted to a jury set up by the Commission. The three best entries shall be presented to the Second Ordinary Session of the Assembly of Heads of State and Government of the Union Scheduled to take place in Maputo, Mozambique in July 2003, which shall choose the AU official symbols (anthem, flag and logo). Addis Ababa -- The member states of the African Union have decided on Thursday in Addis Ababa to retain the emblem and the flag of the former Organization of African Unity. The African heads of states and government made this decision during the third summit of the African Union, which took place from 6 to 8 July in the Ethiopian capital city. The image of the flag illustrated on this page shows the emblem with the map of Africa in brown, which seems to be incorrect. The emblem should be of the same colour as the two thin stripes, that is dark yellow. The image shown here with brown bands is based on a flag seen for the African Union's Ceasefire commission in the Darfur region of Sudan. The CFC's role is similar to the UN peacekeepers in other conflicts. The flag used is simply the union's flag defaced with the commission's initials. REQUESTS the Commission to submit the outcome of the selection to the 9th Ordinary Session of the Assembly in July 2007. In implementation of Decision Assembly/AU/Dec.151(VIII) adopted at the 8th Ordinary Session of the Assembly of the African Union held in Addis Ababa from 29 to 30 January 2007, the African Union Commission launches a competition for the selection of a new flag for the Union. The conditions for participation in this competition are set by these Terms of Reference. The objective of the competition is to select a new flag for the African Union from proposals submitted by candidates participating in the competition. b) Member States, numbering 53, if represented, should be depicted by one or more stars on the flag. The competition is open to all African citizens wishing to take part as well as those of the Diaspora. 4. An undertaking duly signed by the candidate, according to the model attached hereto. Proposals received will be short-listed by a Special Committee established for that purpose. The deadline for the submission of the paper and electronic versions of proposals is Monday, 30 April 2007. The external envelope should bear the indication «New AU Flag Competition». The e-mail including the proposal as an attachment should be sent to the following address: webmaster@..., by latest 30 April 2007, the date the email is sent serving as proof. A prize in cash or kind to be awarded to the winner. The Republic of South Sudan was officially admitted as a member of the African Union on Monday, 15 August 2011. The flag of the Republic of South Sudan was hoisted among the African Union Commission flags at a special ceremony at the African Union commission Headquarters in Addis Ababa. The flag hoisting was conducted in the presence of the President Kiir of South Sudan, the Deputy Prime Minister of Ethiopia H.E Haile Marian Dastaly, and Chairperson of African Union Commission Mr. Jean Ping, besides other members of the AU/C. "This is a historic day for South Sudan and for the African Continent as well." It is with these words that Dr. Jean Ping, Chairperson of the African Union Commission, warmly welcomed General Sallva Kiir Mayardit, President of the Republic of South Sudan, at the headquarters of the African Union in Addis Ababa, Ethiopia. Before the Deputy Prime Minister and Minister of foreign Affairs of Ethiopia, Ministers, AU Commissioners, the Deputy Executive Secretary of the UN-ECA, Ambassadors, and an enthusiastic South Sudanese Delegation, Dr. Jean Ping celebrated the official admission celebration of South Sudan to the African Union. He announced that the African Union Member States had promptly accepted the Republic of South Sudan as the 54th Member State of the African Union. ..."
Although not mentioned in the text of the press release, it is entitled "AU adds 54th star to its flag" so we can assume that another star is to be added to the flag of the AU to represent South Sudan.